Some people think that white flour and white sugar are evil. I don’t feel that way. I’ve been making treats for years (and years and years) with both of those snowy ingredients and I feel just fine about them. In this post, I talked about how I feel like balance – in food but really in anything – is key. If you’ve been eating lots of white flour and white sugar lately, maybe you should eat some kale. Or maybe you should eat this cake. It has half whole wheat flour and is sweetened with maple syrup. Now to some people, that may sound like health food. Don’t worry, it is still cake. If you are used to never having sweets, this might be a mind-blowing after dinner treat. If you, say, eat Easter candy after dinner, this might be more of a very subtle and lovely brunch cake. Either way, I like it for its coffee-with-milk coloring, its subtle sweetness, and the burst of (frozen!) berries. I followed my own advice and doubled the recipe for two cakes. Do you do this? 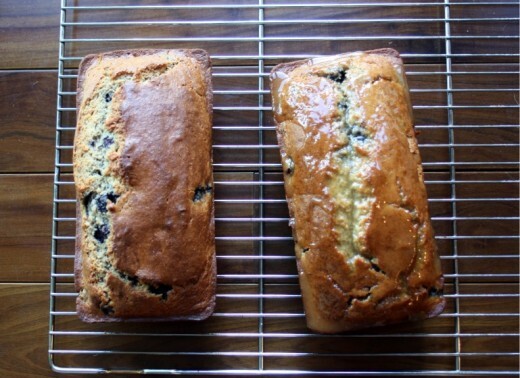 Any time I make a pound cake, quick bread, or loaf cake of any kind, I double it. No extra effort and that second one, unfrosted or unglazed, will last for 1-2 months in your freezer. So you are never without cake! Don’t tell me you only have one loaf pan. Make a huge investment of $10-$20 and buy another one. They stack together so they don’t take up any extra room. I’m telling you – do it. You can thank me later. Or send me a cake. If you are going to double the cake but plan on serving one of them. Only make the glaze as written. Cakes freeze best without the glaze. Preheat the oven to 400ºF. Lightly grease an 8-inch loaf pan. In a large bowl, combine the flours, baking powder, baking soda, and salt. In a separate bowl, whisk together the maple syrup, egg, milk, and melted butter. Pour the maple syrup mixture into the flour mixture and fold together until just combined. Gently fold in the blueberries. Pour the batter into the prepared pan. Bake until golden brown and a tester inserted into the middle comes out clean, 50 to 60 minutes. Transfer the cake to a wire rack set over a rimmed baking sheet; cool completely. Once cool, run the tip of a knife or an offset spatula around the edges of the pan to loosen the cake. Place a plate over the pan. Flip the cake onto the plate. Tap the sides and top of the pan to help release the cake (the berries might have gotten stuck and this helps unstick them. Remove the pan. Turn the cake right-side up and put on a rack-lined baking sheet. In a small saucepan over medium heat, make the glaze: Stir together the maple syrup, butter, and salt until combined. Stir in the sugar and cook until completely dissolved. Pour the warm glaze over the cake, allowing the excess glaze to drip onto the baking sheet. Slice and serve. 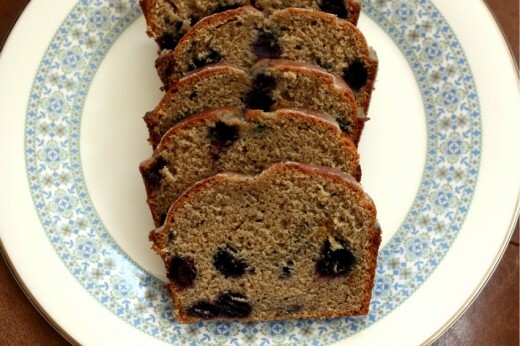 Looks lovely — I’ve adapted this recipe a few times for muffins, but I definitely want to try the cake soon. I love having frozen blueberries around for things like this. 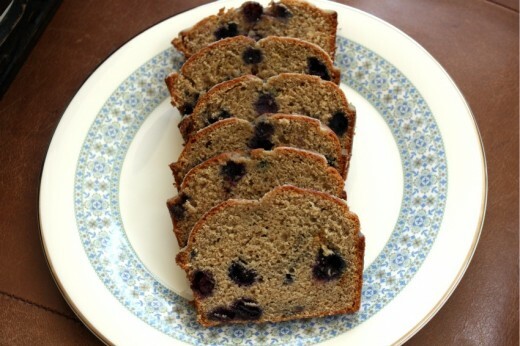 I like any loaf cake, and I will try the half whole wheat flour in this recipe. I like the maple glaze too. Yummy! I lovely your “white flour/sugar” mentality and it’s pretty much mine as well. I eat kale (or some leafy green) at least once a day…so I feel like having dessert two times a week (REAL dessert) is totally deserved. Then again, I do also like to healthify my goods every once in a while…especially if they don’t TASTE healthified. And I do really like the taste of whole wheat/whole grain things. this sounds absolutely lovely! I’m ashamed to say I own this cookbook and have yet to bake anything from it…I really need to since we both know that Ms. Clark is pretty much a genius. What a fabulous idea! Yum! I made this cake for dessert tonight. Instead of baking it in a loaf pan, I put it into a bundt pan (took about 45 minutes to bake at 400F). I served it with a lightly sweetened whipped cream. It was a family dinner and everyone agreed that this should be the ONLY cake ever made for any family event ever again. It was so delicious! Light and fluffy (you couldn’t even tell there was whole wheat flour in it), full of flavor, moist in the inside and the edges bake up crispy, which is surprisingly fantastic contrast. Amazing! Thank you!